Volunteer attorneys are available for advice and representation at Old St. Mary’s Church every 3rd Saturday at 9:30 a.m. Generally, services are available to those whose income does not exceed 175% of federal poverty levels, so for a family of four the income for eligibility is about $3400 per month. Lawyers are available for matters such as guardianship, adoption, divorce, landlord/tenant, consumer problems, wills and bankruptcy. Call 312-332-1624 for an appointment, asking to be scheduled for the Old St. Mary’s Clinic, or just come in any 3d Saturday at 9:30 a.m. The law clinic is located at Old St. Mary’s, 1500 S. Michigan, enter under the blue awning just south of the church. 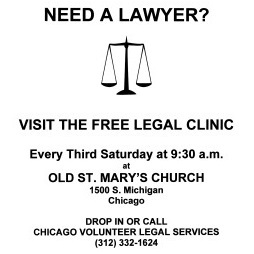 The Old St. Mary’s Law Clinic is sponsored and supported by Old St Mary’s and St. Thomas the Apostle churches and by Chicago Volunteer Legal Services Foundation. The clinic is held on the third Saturday of every month at Old St. Mary’s Church in the South Loop. It is staffed by 32 volunteers, including 23 attorneys, eight intake workers, two of whom are social workers, and an administrative assistant. Each month five or six attorneys and three or four intake workers see about ten clients. The attorneys provide follow-up services to those clients after the initial interview. Attorneys are scheduled to come once every three months and intake workers come every other month. Since its beginning in February 1988 at Visitation Church in Englewood, the clinic has provided services to more than 2,500 clients from the South Side and the greater Chicago area. Many of the cases are in the area of family law, with a heavy concentration in minor and disabled adult guardianships. Other cases handled include landlord-tenant problems, consumer complaints and collection defense. Administrative support, training materials and malpractice insurance for the clinic are provided by Chicago Volunteer Legal Services Foundation, an organization made up of about 3,000 volunteer attorneys providing services to the poor in Chicago. The clinic has been very successful in its more than twenty-eight years of operation. It provides much needed legal services to the community and it provides the volunteers with an opportunity to use their professional skills in service to the poor. For more information about the clinic, please contact Mary Anne Smith, smithmaryanne77qmail.com, 773-493-3418.